SCTs generally seem to get a bit of a bad press compared to refractors and dobsonians. However, as an experiment, having only owned refractors previously, a few months ago I purchased a Celestron C11 purely to get some image scale on smaller objects when using my night vision monoculars. And I’ve been rather pleased with my C11! It definitely achieves the aim I had for it. After seeing a few posts recently mentioned the crescent nebula, I decided this was an object I wanted to see! So tonight, out came the C11 and using an afocal approach with a 55mm plossl, I reduced the f ratio down to a still quite fast for NV, f5. But crucially this was a magnification of 50x and enabled me to see some decent detail (including filaments) on this very attractive DSO. It turned out to be a short session due to clouds rolling in quickly, but the views I got of the crescent made it worthwhile. It also shows to me that SCTs do have a place in NV observing as compact large aperture scopes with tracking. Phone photo attached, iso 50, 30 second exposure. That's an awesome image! Is that about what you see just with NV equipment and your eye? What NV equipment do you use? I know they can be quite expensive. But I can dream about using one with my C-11. Holy cow, that's great! I can only barely make out the filaments with my 5" refractor. The image scale really helps here. Very nice! For an SCT, I think afocal is giving better off axis illumination than you get at prime focus using a 2" diagonal and .5x reducer. That compo vignettes very badly. The 55mm a focal does indeed seem better with the C11. Yes the view through the NV eyepiece is very similar to the phone photo. The eye doesn’t seem to need as long exposure time. Maybe some of the finer elements of the nebula are a bit easier to see in the photo than real-time. As I’m based in the UK, my NV options are very limited. I use a pvs-14 with photonis 4g tube and tnvc televue adapter. All my NV observations are done afocally as a result but I’ve been very pleasantly surprised by the results. Edited by Gavster, 20 August 2018 - 02:45 AM. It’s just one 30 second exposure. Edited by Gavster, 20 August 2018 - 04:23 AM. Yes I’m finding that using the 55mm plossl afocally is giving good results in all my scopes for both vignetting and edge aberrations. Edited by Gavster, 20 August 2018 - 02:43 AM. I find that at prime focus a .5 reducer vignettes too much as well. I use a .7 at prime and love the views. You just can’t beat image scale for detail. Try a few globular clusters next. SCTs (as with video imaging) are compact, optically plenty good enough for this purpose, reasonably priced, can be reduced easily, with their moving mirror there should be no in-focus travel issues and for larger image scale views in a portable package SCTs are hard to beat. What’s not to like? Pretty close. And of course you can see alot more and from light-polluted locations as well. Yeah, I see people that have six or seven telescopes and $2000 worth of eyepieces in their signature line bemoan the cost of an image intensified eyepiece and I an see things with my used $225 Comet Catcher or a $200 SLR lens that would make them gasp. I enjoy my Comet Catcher more than I did my C14. My first view of so many targets on my bucket list was not with my C14 under darker skies, but with my Comet Cather sitting on the curb (not even using a telescope mount) in a red zone sky. To the OPs post though, I know Peter and I used his C11 several times with the .5x reducer, and while the center of the field could be quite glorious, the vignetting was pretty serious. 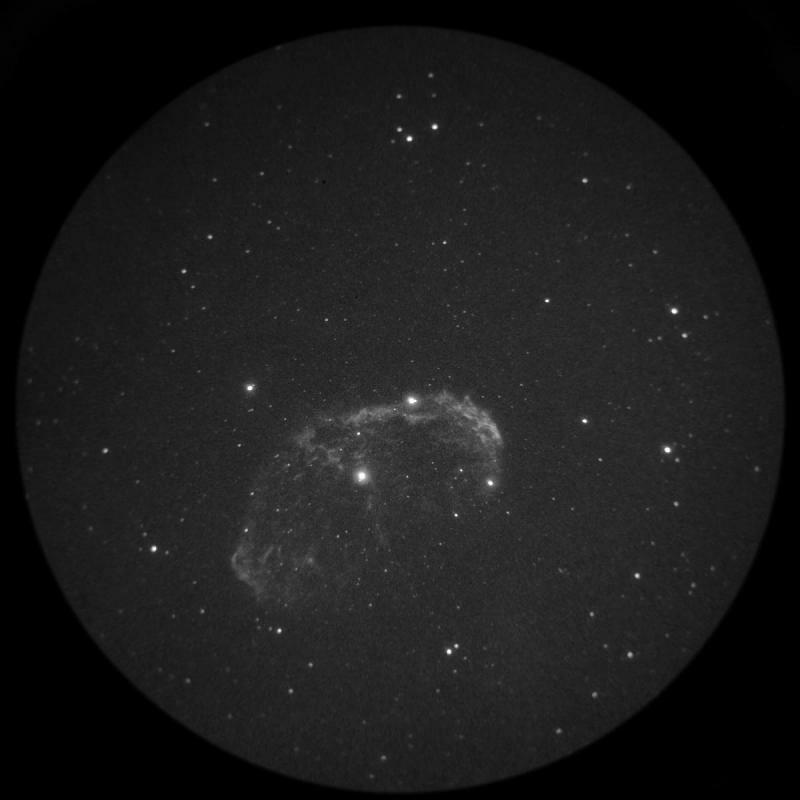 It really detracted from the view, and to see some of the outlying nebula, the scope had to be slewed around. I can see how the 55mm would work much better in the C11 than using a focal reducer would. Your view of the Crescent is nearly identical to what I get with my OGS RC-10 afocally with the 55mm Plossl at f/4.6. I am beginning an observing program of NGC globulars using a Baader Hyperion 17mm afocally in the same telescope using the Baader silver diagonal. Initial views are very promising and I hope to give a bit of a report once I have had more time with the setup. This...I find the same with my C11. It's my goto EP. Another update. I got a 16inch f4 dob a few months ago. Having use it a few times with my NV monoculars At the moment I much prefer the c11! Much easier to setup, more pleasing views so far and much more comfortable viewing position...I’ve found the dob rather tricky to get decent views from. I need to focus on getting the coma corrector in the right setting and the 41mm pan is much better than the 55mm plossl in the dob which means that the dob speed of f2.8 isn’t much faster than the focal reduced c11 with 55mm plossl of f3.5. Quite surprised by this at the moment. In the Dob, you are using a coma corrector in front of a 41mm Panoptic with PVS 14 in afocal? In the C11, you are using a reducer with a 55 Plossl and the PVS 14 in afocal? What reducer are you using? And, are the stars at the edge of field still perfectly round? In the initial post from last August, you were using the C11 with the 55 Plossl which produced very nice edge of field performance, producing a bit more magnification at f:5. Visually, is the C11 better with or without the reducer in terms providing a flat field? For Phonetography, does adding the reducer to the C11 + 55 Plossl cause any field distortions? Yes those are the two setups I am comparing. I am using the astro physics photo visual 0.75 reducer with the c11. I bought adapters so that this reducer plugs in before the diagonal. I’m pretty sure this was the setup I was using in February when I was doing my galaxy observing with the c11 (there’s a thread with images here but I don’t specifically mention the reducer). Since getting my Tak Epsilon in September I’ve been much more focused on getting nice edge stars because I think the Epsilon produced such horrible stars at the edge with the 55mm plossl. So I recall that I do get round stars at the edge with the c11 and 55mm plossl, both with and without the photo visual reducer. To be honest I’m not seeing any flattening affect from any reducer I am using (eg the gso reducer with the Baader earlier this week didn’t have any noticeable impact on the edge stars but I’m happy with that since they look fine to me). Certainly the images I took in February with the c11 show decent edge stars imo. But I will check this next time I’m out with the c11. Over the past 6 months I’ve gradually become more negative about using the 55mm plossl afocally. It gives noticeable edge distortions even with f6.6 refractors. This is something that has been noticed by all the U.K. NV users. I’m guessing that operating the plossl at such large exit pupils of 10mm plus is pushing it too hard. I think the 41mm pan will be my main NV eyepiece now using it in the Epsilon and most of my refractors (in conjunction with the gso or ap reducer). However, the exception may be the c11 where I really need to reducer and 55mm plossl to get the speed down to an acceptable for me visually of f3.5. I tried a field flattener with the Baader and 55mm plossl but this just bloated the edge stars significantly so didn’t work. A big issue I have found with the reducers and 41mm panoptic is the need for lots of in focus. Hence i need to put the reducer in the diagonal rather than before the diagonal which reduces the reduction a bit to say 0.8x but enables me to reach focus. With the c11 this hasn’t been an issue. So another experiment I’m going to try is the ap reducer before the diagonal and the gso reducer after the diagonal. May well cause vignetting but would get the c11 down to f 2.8 which for visual would be nice. For phonetography I can take exposures up to 30 seconds so f3.5 to f5 works fine but for visual I’d like to get nearer f2. The Epsilon with the 41mm pan giving f2 is a very nice visual setup. Edited by Gavster, 02 April 2019 - 02:39 AM. Thanks Gavin for your explanation; it's very helpful and explains exactly what is producing those nice flat field images. I'm still prone to use my NVD in prime, so the information chemisted posted about the GSO R/C reducer might work with my f:7 140 refractor. I currently use a .8x Orion reducer that works pretty well with that scope, but does not produce perfect stars (small ovals) at the edge of field which is annoying only in phonetography images. Visually, it is quite acceptable. For images, I would love to get this flat field scope down to a faster focal ratio with excellent edge of field performance... without having to purchase the very expensive TEC reducer or the AP photo/visual reducer. I think the GSO R/C reducer is worth a try, based on chemisted's and your reports. I have found that my f:3.8 Newt with MPCC provides very good edge of field performance. And the same scope using the ASA reducer/flattener at f:2.8 is also about perfect for my needs. Using this Newt with a 2x ED barlow is OK... but it dims the image considerably with a slower focal ratio. I do get better results removing the barlow cell from it's tube and attaching it below the NVD, where it is working at about 1.5x, boosting the focal ratio to f:5.7, instead of f:7.5 at 2x (providing a 1200mm FL instead of 1600mm FL). Your report about reducing the f:10 SCT is encouraging, and it is a route I will consider to get better scale for galaxies and PNs. Using a 9.25" SCT (the largest SCT I can use without changing mounts) with reducer would provide plenty of scale for these small and often dim (low surface brightness) subjects. Before I make any changes though, I am going to wait until iOS 12.2 is released. Changes in my phone camera performance may negate the need to purchase another scope!